Virtual reality as an assessment of social cognition in behavioural variant Frontotemporal Dementia: A Pilot Study. How to Time Travel in Highly Immersive Virtual Reality. 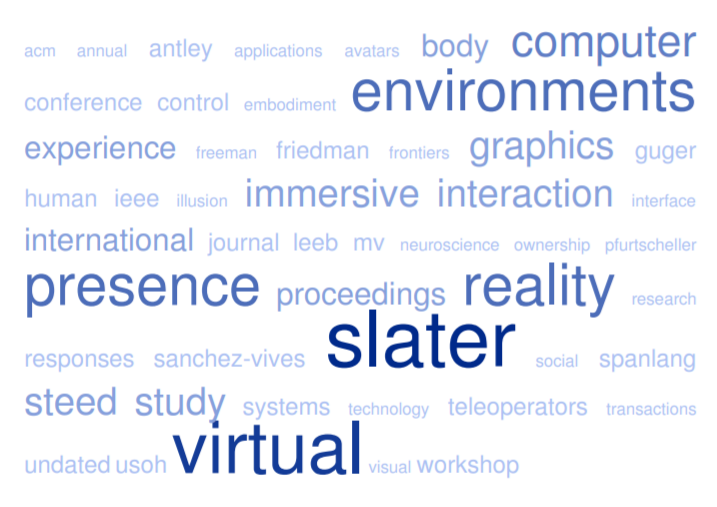 Testing the continuum of delusional beliefs: An experimental study using virtual reality. Spinoff-Transferring Energy between Real and Virtual Worlds. Interactions with Virtual People: Do Avatars Dream of Digital Sheep? Walking by thinking: the brainwaves are crucial… not the muscles! Can virtual reality be used to investigate persecutory ideation? F Maringelli… J McCarthy… A Steed… M Slater… C Umilt? Guest Editor’s Introduction to the Special Issue: The First Workshop on Presence. Are your there? Presence in virtual reality (panel): what is it about and why care? Introduction to special issue: Framework for Immersive Virtual Environments Conference of the FIVE Working Group… London… December 1995. How Colourful was Your Day? Controlling virtual environments by thoughts. The Effect of Haptic Feedback in Establishing Basic Social Interaction within Shared Virtual Environments.